Hellllooo Green! I have been loving green lately. Nail polish, handbags, scarves, etc. It's probably not the "ideal" nail polish color for everyone, but I am drawn to it. This is Zoya Josie from the 2013 Stunning Collection. Josie is described on Zoya's site as "a full-coverage grassy green cream." This was completely opaque in two coats and applied perfectly. I couldn't ask for anything better. With my collection of green nail polish growing, I decided to show you a few of the others I have for comparison sake. These aren't necessarily dupes, but I always like to see other greens to compare. 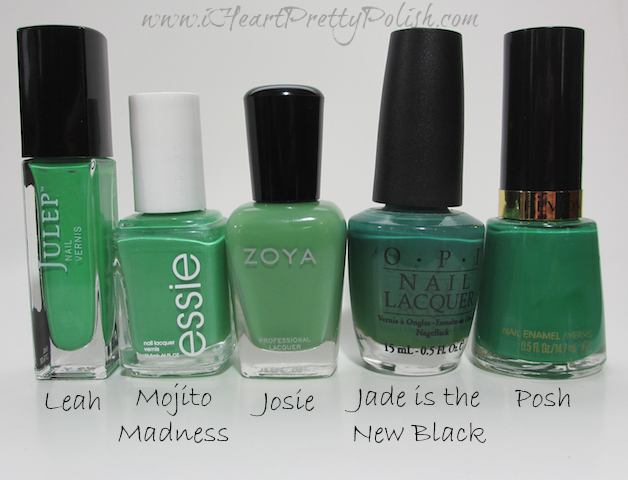 As you can see, Essie Mojito Madness is pretty darn close to Zoya Josie. It's a bit more cool...Josie may have a little more yellow in the formula, but they are very similar. Not sure if you can still get Mojito Madness in stores - it may have been Limited Edition, so I think Josie is a great alternative - especially the formula. Julep Leah is also pretty similar, but it has a bit of a sheen to the formula (that doesn't show as much on the nails as in the bottle) and leans a little more "neon". The photo below shows more direct light and you can see the brightness of Leah better. I know OPI Jade is the New Black isn't even close, I just wanted to show it in comparison to the rest. And Revlon Posh is a perfect true green. Love it! I hope this helps if you are trying to sort through the greens that are on the market. I actually have another green coming from overseas from an awesome nail polish friend that offered to send it to me...along with some other goodies. Thanks Becca from Horcrux Nails - you are the BEST! Don't forget about Zoya's Earth Day Promotion that is going on right now. Also, if you have never ordered from Zoya, feel free to use my referral link at the bottom of my page and receive your first polish for free. 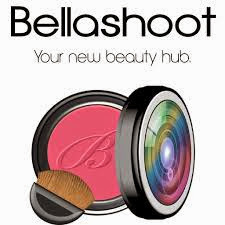 The coupon will be in your "Coupons/Promotions" area under your "My Account" section after you sign up. What is your favorite green polish? *Note: Zoya Josie was provided to me for my honest review. See my Disclosure Policy for more information. I'm a green lover too, although my main love is for mossy greens. I have Revlon Posh and love it. It's such a perfect clean color crayon green. Great post! yes, I always picture crayons too when I look at nail polish:) Thanks for stopping by! Just Googled it, it looks really pretty! Nothing like what I have. Hi Essie, this is a wonderful post!! Josie looks like made for you - it is a must-have in my eyes, the perfect fresh and intense green, like those fresh green medows we both (along with the geese ;-)) long for!!! And great comparison, truly helpful and despite having Essie Mojito Madness I feel totally drawn to get my nails on Josie and visa-versa - LOL!!! Yes, I am still longing for the grass. It snowed again yesterday:( LOL, if you have Mojito Madness, you may not need Josie. But the formula is a lot better! Well you should pull one out and wear it! You are sure welcome:) Have a great day!